This photo was taken on 6/13/16 at 5:20PM. The location was at the street entrance to a very small hotel in the Georgetown section of Washington DC. The "Take It!" 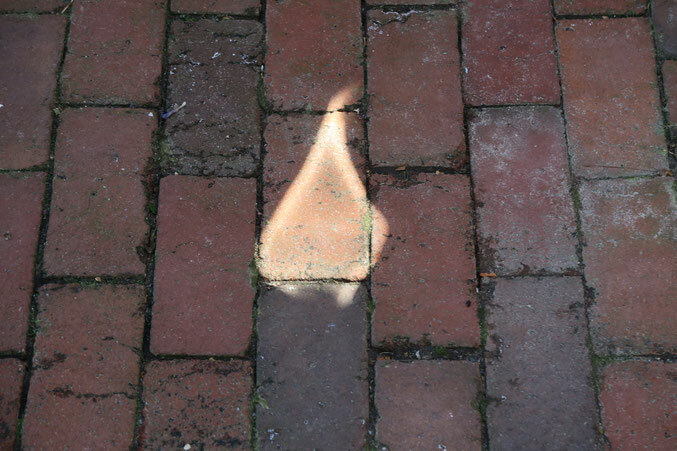 came from my walking into this shadow filled entrance which I had passed through many times before and never having seen this bit of color on the walkway bricks. I stopped and took several photos and then engaged in the game of trying to find the source of the reflection. An older lady happened to come into the area and observed me running my hand up and down in the air in the location attempt. I explained what I was doing and, to my surprise, joined in the hunt. We found the small item in the top of a flower pot, and had a laugh at the game of it all. I thanked her for her help in solving the mystery. She said it had been fun. The After Take: The compound fun of this photo is great, as it gave two adults a chance at playing a bit of childhood type adventure, and success in the doing. I am finding expressing appreciation, often has a rewarding response. That is one clean piece of glass!! Hey Mr. Bruce, Hope all is well with you and yours. Good to see you back sharing your photographs! I look forward to seeing more.